A Zoella Bookclub title 20161. Read this book. 2. On reaching the final page, you may experience an urgent need to read it all over again. 3. Check your friends have read it. 4. NOW YOU ARE FREE TO TALK TO THEM ABOUT IT ENDLESSLYWinner of Goodreads Best Young Adult Fiction Book 2014'E. Lockhart is one of our most important novelists, and she has given us her best book yet. 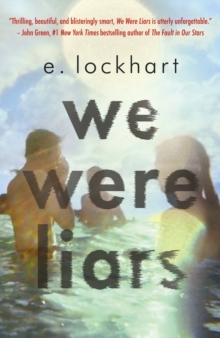 Thrilling, beautiful, and blisteringly smart, We Were Liars is utterly unforgettable.' - John Green, #1 New York Times bestselling author of The Fault in Our Stars'Irresistible' - New York Times Book Review'Haunting, sophisticated' - Wall Street Journal'Bowl-you-over' - Cosmopolitan'So freaking good' - Sarah Dessen'Such beautiful writing' - Libba Bray'Beautiful and disturbing' - Justine Larbalestier'Better than the hype' - Lauren OliverWe are the Liars. We are beautiful, privileged and live a life of carefree luxury. We are cracked and broken. A story of love and romance. A tale of tragedy. Which are lies?Which is truth?